The time that goes into making these gorgeous pastries is justified by the eternal lip-smacking sensation at mere mention of them, looking to your fingertips as you recall the licking and rubbing of your fingers when finishing one. 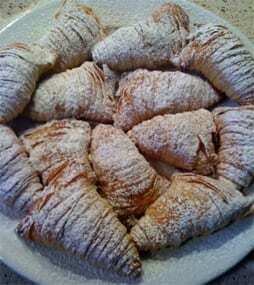 Sfogliatelle are named after folio, the precious pieces of paper in antiquity and when multi-layered like any good rare book their inner sweetmeat provides a citrus cream richness that works on any mezzogiorno high summer day, as well as a winter as perhaps for a decadent comfort treat. The recipe below and step-by-step photos are from Le Virtu’s Chef Joe Cicala is the original but do expect to bump into variations including savoury and even chocolate or jam and ricotta variations… A day out to make pastries is a little decadent but oh what a pastry result. Make a well with 360 g plain flour and a teaspoon of salt. Pour in 180 ml cup of water. Mix with hands gradually incorporating the flour until a rough dough forms. Knead dough for 10 minutes until all the flour is incorporated. (it will seem a little drier than normal pasta). Form the dough into a ball and refrigerate for 2 hours (wrapped in plastic). Remove from fridge and press the dough with hands to form a thick pancake. Pass through the pasta roller continuously on the widest setting to knead the dough. Fold in half every 3rd pass. This will knead the dough and develop the gluten. You are looking for a silky smooth dough. It may take up to 20 minutes of kneading. Form smooth dough into a ball and refrigerate for an additional hour. Combine 110 g lard with 120 g of butter. Meanwhile, bring 240 ml water and a 50 g sugar to a boil. Add 80g of semolina to the sugar/water mixture and cook as if it were polenta. While the semolina cooks on low pass 380 g of sheep’s milk ricotta through a fine mesh sieve. Add the ricotta to the semolina mixture and cook for an additional 2 minutes. Remove from heat and add 2 large eggs, 2 tsp vanilla extract, 1/4 tsp ground cinnamon, and the zest of 2 oranges. Beat the mixture with a wooden spoon until there are no lumps. Refrigerate until ready to use. Remove pasta from fridge and cut into 3rds. Pass each 3rd through the pasta roller ending at the thinnest setting. Cut dough into 1 foot sections and brush liberally with lard/butter mixture. 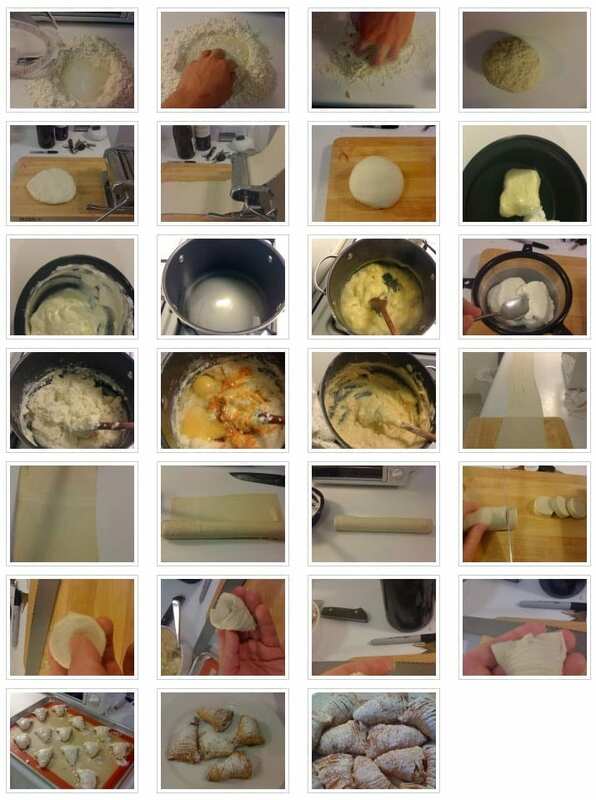 Start rolling one section of pasta up into a cylinder shape. Place on top of another section and roll again. Repeat this until you have about 5 cm diameter cylinder. Trim the edges and wrap in plastic. Place in freezer until lightly frozen but still pliable. Take each disc and start working from the middle outward. Spinning it in your hand push the middle out to form a cone. Stuff with 1 teaspoon of the ricotta/semolina stuffing. Lay the sfogliatelle on greased silicone baking paper and brush liberally with the remaining lard/butter mixture. Bake in an oven at 200 C until golden brown. Remove from oven. Let cool. Sprinkle with icing sugar and enjoy! This is a pastry that continues to defeat me…having now completed a full pastry course I am nearly…but only nearly…ready to brave making it again. It is well worth the risk of failure to get it right though as it is difficult to find good versions of it in the UK (the ones you buy at the markets are inevitably stale and stuffed with pastry cream or chocolate cream, not ricotta).